An environmentally aware company adopts CSR or Corporate Social Responsibility throughout its ranks. RJRC embraces both environmental and humanitarian causes. Good business is doing good in your community, too. 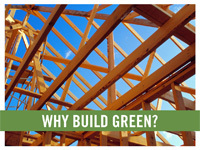 In 1993, the United States Green Building Council (USGBC) was founded to promote sustainability by the encouragement of building green structures and the development of standards. The local chapter of the USGBC supports this agenda in Georgia and the Southeast through a wide variety of programs such as sustainable building, green jobs, high performance schools, and renewable energy. Through the USGBC, RJRC is working for a more sustainable life for future generations. Habitat for Humanity works with people from all walks of life to eliminate poverty by constructing and building adequate and basic housing for those in need. RJRC has been happy to be involved in the construction and renovation of several homes in the Atlanta area.